Where I Got It: from netgalley.com, which hasn’t influenced my review in any way. Promise! 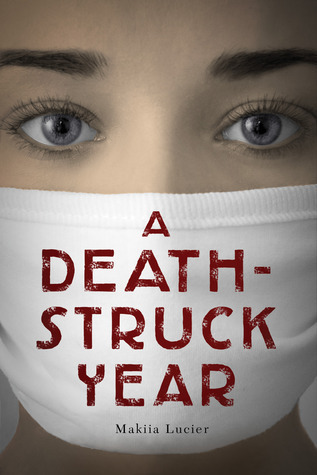 I don’t read a lot of YA historical fiction, but A Death-Struck Year is such a great addition to the genre! I really like that it’s set during the Spanish Influenza epidemic, because I feel like that’s not something that really comes up as a back-drop for historical fiction. And I like that Cleo was so willing to help strangers, even when people didn’t want to help their own family and neighbors. I really liked Cleo and how much volunteering changed her. It really felt like volunteering put things in perspective for her, and she really grew as a person throughout the book. What I liked most was how detailed but interesting A Death-Struck Year is. I know about the Spanish flu epidemic and how horrible it was, but other than that, I didn’t know anything about it. And now there’s a part of me that wants to know more about it. I really liked the note at the end of the book talking about the Spanish flu and that she has a few books listed if you want to do further reading. It seems like Lucier spent a lot of researching because I could picture everything so well, and everything was described so well. I really could picture everything unfolding the way it did in A Death-Struck Year, and I felt like I had a much clearer picture of how bad it really was after reading this book. Something I couldn’t help but wonder while reading A Death-Struck Year is how we’d react if such a thing were to happen today. And it’s also something I can imagine happening today, with a different disease. And I liked that Cleo wasn’t sure what to do with her life, but decided to take things one day at a time. I definitely think her time with the Red Cross and all of the people she met and worked with and helped made a big difference on her life and her realizing that it’s okay not to have everything figured out. I’m not sure how I feel about the ending. The book only takes place over the course of a few weeks, and you get closure on everything that happens. It does work well with Cleo taking things one day at a time, but part of me wanted an epilogue or something that gave me a picture of what Cleo’s life was like some period of time after the events of the book. Don’t get me wrong, I thought the end was very fitting to what we see unfold in the book, but there is that part of me that wanted to see Cleo’s life weeks or months after everything started to go back to normal. I really liked A Death-Struck Year! I think it’s a really great look at a period that I’m not very familiar with, and it felt like Lucier put a lot of time into researching Portland during that time. I could picture everything so well! A Death-Struck Year gets 4 stars.